Though there are fewer holidays during the summer months, there are many gift-giving occasions that business owners should use to market their goods to consumers. There are a lot of graduations, weddings and anniversaries, visits to extended family and more that will have people looking for a good gift for loved ones. According to a recent survey, a lot of consumers will be looking for gift cards this summer to give to their loved ones. 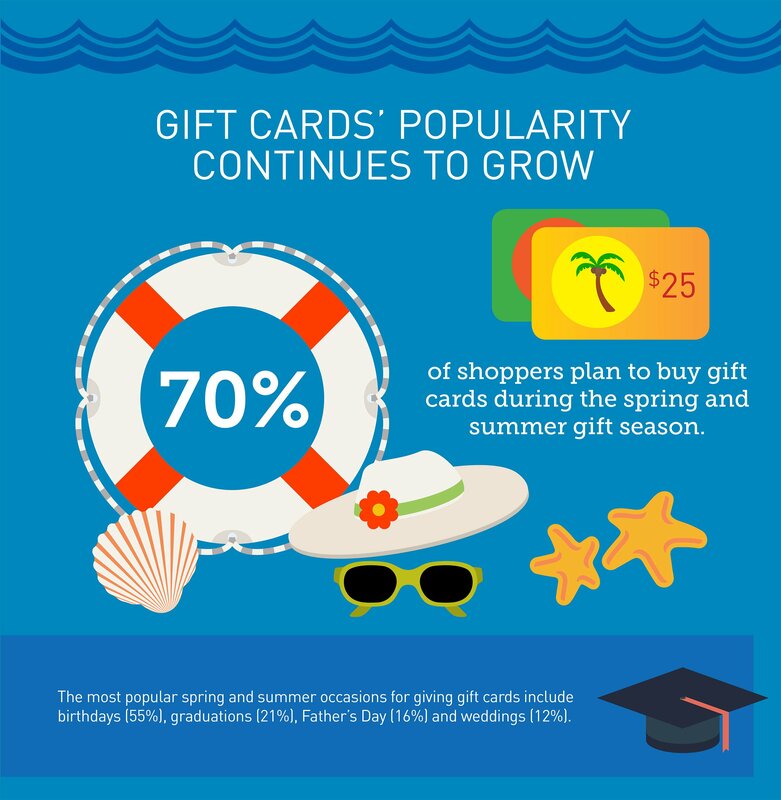 According to a new study from the Retail Gift Card Association (which is admittedly a biased source for this kind of data), more than 70 percent of shoppers will be giving gift cards for upcoming gift-giving occasions like graduations, Father’s Day, and weddings. The study is based on a survey of more than 1,000 U.S. consumers on their use of gift cards and habits for giving and receiving the cards. They were also asked about their perceptions of physical gift cards versus newer gifting options like electronic gift cards (e-gift cards), which can be redeemed online or via a mobile device using a virtual code. The majority of people surveyed (56%) they would only be using traditional gift cards. But this does mean there are a lot of people who are willing to try the e-gift cards, so it something online retailers should keep in mind. This information is useful to small business owners as well as the marketing departments of large retail stores. According to the survey, nearly half (47%) of the consumers surveyed say they prefer to give restaurant cards as a gift. Department store cards were the prefered choice of 30 percent and 29 percent give online cards like Amazon. The most common amounts are $25 and $50 and four out of five (82%) of the shoppers surveyed said they planned to spend more this season than they did at the same time last year. Another key takeaway is that people want flexibility with the gift cards they buy. Four out of five (80%) gift card givers want recipients to be able to use the gift card online or in-store. Many retailers already offer this so business owners should expect that sentiment to increase in the future. Most ecommerce platforms have the option to accept gift cards so business owners need to bite the bullet and update their ecommerce platform if necessary. Many retailers haven’t heard of or used e-gift cards and they really are something to be considered. As more shoppers receive e-gift cards, the awareness of this type of gift is growing. According to the research, one in four (27%) gift recipients have received e-gift cards, a 5 percent increase from last holiday season. There are a few reasons why people would consider e-gift cards. They make excellent last minute gifts. About a third (32%) of shoppers want to give e-gift cards when the giver needs the gift to get there right away. They seem like a good fit to about a fourth of shoppers (28%) who give e-gift cards when giving to younger people who live a digital lifestyle. And 18 percent made the logical choice to buy an e-gift card to avoid shopping in crowds. As was mentioned in the beginning, this research comes from the Retail Gift Card Association so this research should be taken with a grain of salt and the shaker nearby. Still, ignoring the specific percentages, there’s a clear market for gift cards as gifts during the next few months. This is something business owners should take advantage of for higher sales during the summer and to prepare for even greater gift card sales during the winter. For more information about marketing research, read this article on the effect social media has on buying decisions.